Showcase of the Arts (Part One) - Thursday, May 9, 2019 from 9:00 a.m. to 11:00 a.m.
HSC Student Visual Arts Exhibit and Musical Performances. 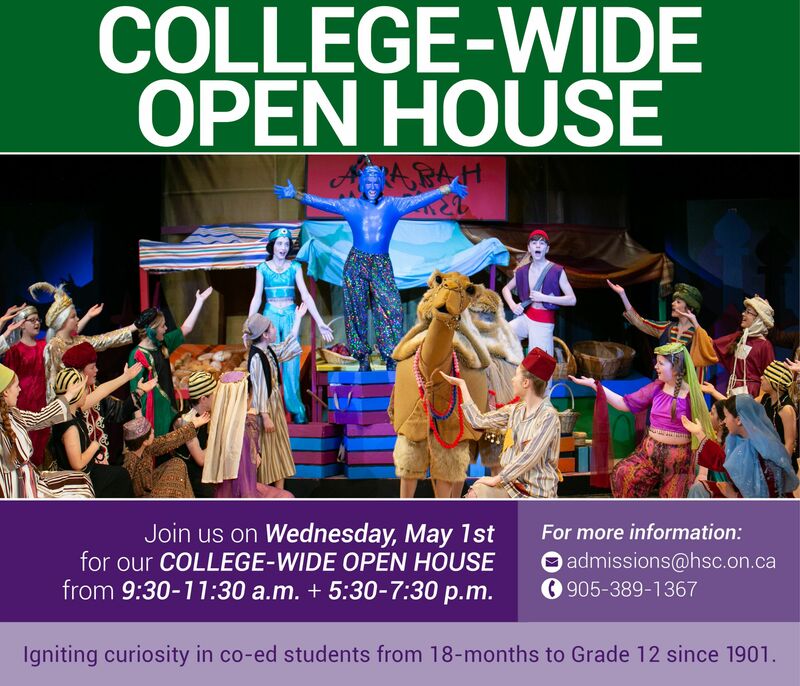 Showcase of the Arts (Part Two) and College-Wide Spirit Rally - Friday, May 10, 2019 from 9:00 a.m. to 3:00 p.m.
HSC Student Visual Arts Exhibit and Musical Performances plus College-Wide Spirit Rally. Homecoming Day 2019 - Saturday, May 11, 2019 from 8:00 a.m. to 2:00 p.m. The day begins at 8:00 a.m. Make the registration table your first stop to check in and pick up the bracelets you will require for our complimentary pancake breakfast and barbecue lunch catered by The BBQ Gourmet. Dress for the day time events is casual with house and school colours encouraged. Be sure to cheer on HSC's athletics teams to victory during this year's Homecoming games being played throughout the day. Other Student and Alumni low impact games are also being run throughout the day so be sure to register to take part! *To assist us in our planning, please note that registration is required for all events marked with *. Thank you! Kick-off Homecoming Day with a fresh coffee and a complimentary pancake breakfast catered by The BBQ Gourmet. Check in for the day’s events, connect with other members of the HSC Community and fuel up before heading over to participate in Hektor's Home Run 1km or 5km - a fun run for the entire family! All members of the HSC community are welcome and encouraged to participate in this family friendly fun run. 1 km and 5 km routes options. Event schedule is subject to change. For more information or with questions, please email hektor@hsc.on.ca. Be sure to cheer on HSC teams to victory during this year's Homecoming games scheduled throughout the day. A friendly, elimination mixed doubles tournament for all members of the HSC Community. All skill levels are welcome. Prizes will be awarded to the winning pair and runners up. If you don't have a partner, no problem! Register as a single player and you will be paired up. Community Centre - Spallacci Gym and Senior Student Commons. Enjoy browsing the HSC student visual arts displays from all four schools. Support our Pine/Yre House and HSC Student Council raise money for Cystic Fibrosis Canada. HSC Campus Store is open! Come by to browse what's available and pick up some free spirit items. HSC's Campus Store offering complete size ranges and selection will also be open from 10:00 a.m. to 2:00 p.m. and is located in the basement level of the Strathallan Building. Young students and visiting children can take part in some fun activities including inflatables, games and crafts organized by Faculty and supported student volunteers. Check out HSC our Vendor Village and play a game for a good cause! For students Grade 4/M9 to Grade 12 participating in the Vendors Village, it is an opportunity to become an entrepreneur by selling a product with 10 percent of sales being donated to a charity of their choice. Interested members of the HSC Community are encouraged to register to take part in this fun game of slo-pitch. Exact timing is subject to change. On this tour of campus, discover the developments in recent years and explore new areas. Join Director of Admissions, Sheriann Heath-Johnston and our Student Ambassadors to learn how the campus has been transformed over the years or since your last return. This tour will depart from Main Reception located just inside the entrance of the Holton Building at 11:00 a.m.
A complimentary lunch catered by The BBQ Gourmet will be available for all campus guests alongside the Parents of Alumi Volunteers. Be sure to check in at main registration when you arrive on campus to receive your bracelet then head to Foxcroft Circle to grab your food from the barbecue. Don't miss out on the chance to capture your Homecoming memories in our photobooth. Interested alumni and other members of the HSC Community are encouraged to register to take part in Futbolito! Inspired by soccer, Futbolito is a fun, fast-paced game played without a goalkeeper and with small, hockey-style goals. Participation is open to all members of the HSC Community, ages 12 and up. Co-ed teams are welcome. Register as a complete team (five to seven players), a small group or as an individual player. All are welcome! If you register as a team, you can create name your team and you can even choose team colours! Spectators welcome! All members of the HSC Community are encouraged to take in the fun and cheer on participants. 12:30 p.m. - 2:00 p.m. Join fellow Alumni and Retired Faculty and Staff in the Trjoan Hospitality Zone to play exciting Alumni House Games. Challenge a fellow Alumni to a game of foosball, bean bag toss, giant jenga and more! Adult members of the HSC Community are invited to the Trojan Hospitality Zone to join us for coffee or cold beverage. It's the perfect place for alumni to reconnect with their former teachers, our special guests at this event. Interested alumna are encouraged to register to take part and relive their memories on the court! All skill levels welcome and encouraged to play in this fun fame! Join us for the day and stay for dinner! HSC Alumni are encouraged to participate and enhance their Homecoming experience by taking part in as many events and activities as possible throughout the day, making for a truly memorable weekend. HSC's Reunion Mixer (formerly Reunions Dinner) is the perfect atmosphere to reconnect with old friends and cherished faculty to celebrate alumni celebrating milestone reunions. As a group we will honour classes ending in '4 and '9 as well as this year's Heritage Athletic Hall of Fame inductee. Taking on a new format in 2019 with an emphasis on a fun and social atmosphere. Join us for delicious food and great company.